If you haven’t already heard, Zack Wheeler has a torn UCL and likely will be undergoing season-ending Tommy John surgery. We will cover this in further depth later in the week, but for now, it should be noted that Sandy Alderson wasn’t the only one who was “not suprised” that Wheeler’s elbow blew out. However, it didn’t necessarily have to be inevitable (but we’ll get into that soon enough). From his 2011 spring training debut, when we were alerted to the fact that the Mets allowed Wheeler to return to the pitching mechanics he used in high school. The Giants had attempted to make Wheeler’s mechanics more efficient after drafting him. I noticed, but didn’t love, some mechanical adjustments that Wheeler made between spring training and his MLB debut in June 2013 that were related to an attempt to keep his front shoulder closed. Still, Wheeler reached 80 pitches after four innings, and his velocity wasn’t in that 98-99 MPH range that made him such an exciting prospect. Instead, he was hanging in the 95-97 range, slipping to 93-95 in his last two innings, which is still pretty darn fast. But, it’s mildly concerning that Wheeler’s velocity has dropped a few MPH so quickly after a few innings. I imagine part of it has to do wit all of the mechanical adjustments thrown upon him by Dan Warthen; when and athlete is thinking, he’s slowing himself down just a bit. I hope that’s the problem, rather than my more serious fear: an arm issue. At some point in the next few years, Wheeler is very likely to have a shoulder and/or elbow injury, because his hand is not where it needs to be when his front foot comes down — it’s a good two beats behind most of the time. That means his arms and legs are not in sync, which means his arm is “shouldering” (pardon the pun) most of the load. First, the front shoulder: it’s clear that Wheeler is conscious of, and working very hard to, “stay closed.” He’s over-compensating to the point where he’s over-rotating the upper body, which is causing the front shoulder to open too early — ironically, the exact issue he’s trying to avoid. It’s a common occurrence, thanks to numnut pitching coaches who don’t know jack about human kinetics. Secondly, and much more importantly, is the position of his throwing hand at “foot strike.” It’s far behind where it needs to be — at this point in his motion, the ball should be at a “launching position,” high in the air, ball pointed toward an area between second base and shortstop, with his forearm at a 90-degree angle to the ground. Being this far behind means there is undue stress on the arm to propel the baseball; all that stride and rotation is doing next to nothing (if anything) in regard to velocity. Wheeler’s fastball velocity is entirely dependent on his arm speed. This is not a “great” nor “outstanding” delivery as Ojeda describes — it’s bad, and dangerous. If he “consistently” throws this way, he will injure his arm quickly. His is very, very similar to Mark Prior‘s delivery — trust me, Prior’s injuries had nothing to do with chance, and everything to do with where his hand was at foot strike. That’s not my opinion, it’s the proven fact of scientists who study benign subjects such as human body movement. I’m sure that the Giants had an idea that Wheeler’s motion was dangerous, which was why they were trying to adjust it. Whether they knew exactly what the problem was, and how to fix it, is another story. And no, changing a pitcher’s motion doesn’t mean he’ll lose his effectiveness — IF the adjustment is made correctly. I’ve argued this point in the past too often, and not arguing it again — efficient, safe mechanics are ALWAYS better than the alternative and can only improve a pitcher’s effectiveness over the long haul. Just one thing: why was he removed with two outs in the seventh and .152-hitting pitcher Cliff Lee at the plate? Talk about knee-jerk reaction to the terrible news earlier in the day. Terry Collins explained it was because Wheeler had reached that magical, randomly chosen pitch count of 105, and didn’t want to stress him any further. Stress? Wheeler had not pitched with stress. Through six and two-thirds, he threw 105 pitches — an average of about 16 pitches per inning, which is one pitch away from the ideal target of 15 per. More importantly, he didn’t really have any stressful innings — his second inning went 20 pitches, and his fourth frame went 21, but otherwise, it was all fairly breezy, 11-14-pitch innings. Personally, I’m convinced — based on both qualitative and quantitative kinetic research presented by scientists — that Wheeler’s mechanics are going to eventually result in chronic arm problems. But throw that out the window for the moment and look at it from the Mets’ perspective: they changed him BACK to that dangerous motion, so either they don’t believe the science, or they don’t care. Regardless of which it is, their reliance on a hard number — be it pitch count or innings limit — pushes them even further away from logic and science. But that’s not even the worst of it — the worst is that their messages, actions, and philosophy regarding their young pitchers are in a constant state of flux. There is no consistency, no adherence to a long-term plan — in fact, no plan at all. One day, they talk about pushing their starters a few extra pitches, or an extra inning, because they need to learn to battle. Another day, they’re cutting off a starter prematurely, whether it’s due to a predetermined pitch count or to make him “feel good about himself.” Now with the injury to Harvey, everything goes out the window. If I’m the Mets pitching coach, Wheeler doesn’t even take the mound until he adjusts his motion to be less dangerous — which is what the Giants were working on before giving up and trading him to the Mets. But assuming I’m fine with a pitcher’s mechanics, and he’s pitching into the seventh inning of a ballgame, and he’s breezing through, I’m allowing him to continue pitching until/unless I see fatigue. It could be 90 pitches, could be 105, could be 125 — but the point is, as a manager or coach, it’s my job to see how a pitcher is doing, “take his temperature” from the dugout, and know when he’s had enough. Wheeler, in this ballgame, had not had enough, was still pitching without stress, and was still the Mets’ very best option to get the final out of the inning. I may not have sent him out for the 8th, and, depending on how he handled Lee, may not have let him face another batter that inning, but Lee was his batter to retire. The above may be the first public indication that the Mets knew they were playing with fire by letting Wheeler pitch with dangerous mechanics. Or, as mentioned previously, they don’t believe mechanics make a difference — they simply believe that injuries are inevitable and cannot be prevented, and so limiting pitches will somehow stave off the inevitable. Bottom line is that either way, they were hanging Wheeler out to dry. It is kind of like buying a used car that you know has an oil leak, but instead of getting it fixed, you run the car to the ground. Maybe you don’t take a few long trips to keep it from happening, but you know you’re going to drive the thing until it stops running. Ten days later, Wheeler again had velocity issues. It may also have been one of those times in the past that he pitched with pain. What happened to the upper-90s fastball? Is he tiring due to it being his longest season ever? I’m not so sure. He was over-exaggerating keeping his front shoulder closed, to the point where it was preventing him from reaching full velocity. A pitcher needs to keep his front side closed as long as possible AFTER his front foot hits the ground. What Wheeler was doing was turning in his front shoulder at leg lift (over-rotating) and keeping it there to the point where it looked unnatural. The result was that his right arm was far behind the rest of his body — even moreso than usual — and his pitches were higher than intended. I also was concerned with Wheeler’s body language. He looked uncomfortable and frustrated from the get-go, which to me suggests he was either thinking too much about his mechanics, or, experiencing discomfort or pain. Bobby Ojeda mentioned that Wheeler’s mechanics looked “great” and “consistent” and that “he wasn’t following through toward first base like last time.” To me, the mechanics were not “great” as his arm continues to be behind, particularly at foot strike. To me, his mechanics were not necessarily consistent — he occasionally had better timing, but only infrequently. As for following through toward first base, yes, he was, fairly frequently, and there is video to prove it. I hope people other than former MLB pitchers are looking at Wheeler’s motion and considering necessary changes that will prevent injury. According to their official blog, the Mets are using some kind of high-tech, cutting-edge, in-game biomechanical analysis. However, analysis is useless unless someone knows what they’re looking at and can apply fixes when needed. It’s kind of like having an X-ray or an MRI taken, and then not having a doctor to interpret the results, and/or a surgeon to perform the surgery. And yes, it’s possible to perform well / put up good numbers with a dangerous process. MLB pitchers do it all the time (and then their arms blow out). I really didn’t mean to pick on Bobby O. It’s really always been more about MLB in general believing they know more than anyone else. Ojeda, I’m sure, believed he knew what he was talking about because MLB’s closed-minded culture is the way it is, and taught him to feel that way. After Game 68 of 2014, I brought to light a dangerous practice of MLB pitchers regarding rest and recovery, and applied it to Wheeler. A few things to address. First off, throwing a bullpen on Tuesday is incredibly dangerous because one day of rest is not nearly enough recovery time for the 86-pitch effort of Wheeler on Sunday, June 8. Wheeler needed to stay off the mound a minimum of three days per ASMI recovery guidelines. However, nearly every single MLB pitcher goes against these guidelines and throws a bullpen too early after a start. Why? Because MLB knows better than science, of course. Secondly, the “different strokes for every organization” quote is a telling truth and an indicator of why there is a pitching injury epidemic in pro baseball. It’s true — and mind-boggling — that each MLB organization has its own rules / routines in regard to what pitchers do between starts. Few, if any, adhere to the ASMI guidelines, which were created not arbitrarily or via guesswork, but based on scientific research. But baseball knows better. It’s remarkable that other sports use scientific research to train their athletes, and as a result, most world-class athletes follow similar if not identical regimens, but baseball … well, it’s all over the place. Teams do whatever they think might work, based on … hmmm … not sure. And we wonder why there are so many pitching injuries, when everyone is being trained differently. Finally, I hope that more pitchers dictate their own throwing programs — after they learn about proper recovery. If teams can’t provide safe and effective methods, it’s up to the pitchers to take their health in their own hands. For those of you interested in learning more about pitching injuries, and how they can be prevented, you can listen to the podcast I do every week with Angel Borrelli. What we discuss is based on science, rather than guesswork and hearsay handed down from one layman to another. We also provide tips on increasing pitching velocity, if you’re into that sort of thing. You can also check out OnBaseball.com for the podcasts, accompanying photos, references, and other baseball tips. Meantime, sound off in the comments regarding Zack Wheeler and the way the Mets have handled him. Next Could Tom Seaver Have Been Even Better? First off, I think its clear your analysis on Zach Wheeler’s injury is spot on. It also highlights the Giants showed brains and courage to deal him. Mets brass has shown little courage in dealing young pitchers even in the face of what can only be called a crisis of TJ injuries. I heard on SNY that in 2014 there were more TJ injuries than all of the 1990’s. Enough said. Second, I’d like to generate some discussion about the obsession with radar guns and the need for speed, specifically, the almost one-eyed focus on how hard a man throws as the basis to determie his chances of success in MLB. Sure, it is one factor and perhaps the most important one but there are others – accuracy, control, movement esp. late, downward plane, changing speeds and good old smarts (think Professor Maddux). I appreciate it is the science and resources invested in hitting thave contributed to getting us to this point. 50 years ago hitters didn’t have the luxury of watching super slo mo replays of the guy they would face the next day, nor did many other advancements in technology (chemistry?) exist. So credit to the hitters who are bigger, stronger and smarter, but I think there needs to be more emphasis at the MLB level on factors besides speed in assessing the value of a pitcher. Perhaps this would lead to guys not throwing so hard they hurt themselves? I don’t know since I have not studied human kinesiology. I have played the game a long time, and when I tried to pitch it hurt like hell. I’ve heard it said many times the throwing action involved is not natural. I am not sure that getting perfect mechanics makes it more natural or less dangerous and harmful, but all of the anecdotal evidence highlights the risks involved in pitching. Final comment, Syd Finch threw over 100 MPH – where did it ever get him? I was under the impression that Sidd Finch returned to Tibet and found nirvana — which of course is priceless and worth more than any money he could’ve made in MLB. Finch was, after all, liberated from our opulent life-style. I agree with you on the radar guns — they are a scourge to development of young pitchers. A big part of it is the laziness of scouts and GMs who simply look at MPH before looking at the entire package of a pitcher. It’s too easy to say, “let’s sign him, he throws 95.” I like to compare the situation to police officers using the radar gun on highways — it’s a heckuva lot easier to go to the judge and say, “hey, he was driving 75, says here right on the gun” than it is to say, “he was driving unsafely, trust me on this.” How many more speeding tickets are issued compared to reckless driving? I think CHASING velocity is more detrimental than actually throwing hard. There are so many “experts” who are really snake-oil salesmen selling their “cutting edge techniques to gain velocity” — which in just about every case I’ve seen, has involved a dangerous mechanical adjustment that might result in short-term results as a coincidence, but hurt pitchers’ arms in the long-term. And then there are the extremely dangerous long-toss programs, medicine-ball exercises, and weighted balls — everyone is looking for the quick fix and exotic answer to cracking 90 MPH, but really, the easiest and safest route is efficient mechanics. And again, I agree. Pitchers who can consistently hit spots, change speeds, and keep batters guessing with three or four well-developed pitches can be quite effective at every level from little league to the big leagues. But MLB signs and drafts first and only on MPH. Alderson said that in the long run this actually might be a good thing for Wheeler’s career. He might of been lying to some how save face for the Mets. Or maybe he sees it as a wake up call to Wheeler to fix his mechanics. However, I fear he believes TJS is actually good for a pitcher and can lead to increased MPHs. This is the ignorant thinking that leads to more elbow problems. Cerrone and co have a post today about how the Mets pitchers have had the 3rd most Tommy John surgeries since 2005. It seems possible they may be ignorant or disbelieving of the science behind good mechanics. Can you break down a pitcher like Chris Sale? He is a Cy Young caliber talent with supposed “scary” mechanics but pitches for a White Sox team that coincidentally or not has tied for the fourth fewest Tommy John surgeries since 2005. The White Sox have the most revered trainer in MLB in Herm Schneider — he’s got a great rep for dealing with aches and pains in way that actually aids healing rather than just getting a guy back on the field. He’s not going to change a pitcher’s motion, but he might have been able to deal with Harvey’s forearm tenderness in 2013 better than the Mets did — prescribing hand and wrist exercises to take the pressure of the slider off the UCL, for instance. Chris Sale is an exception, though. He’s a Cy Young caliber performer with an extremely weird motion. Do you cross your fingers, pray for health, and enjoy his absolute dominance for however long it lasts? Or do you give him a complete overhaul and pray that this brand new pitcher you’ve created will also happen to be effective? The latter might be the better bet for Sale’s career, but the former is obviously in the White Sox’s best interests while he’s under their control. Can you point to someone pitching now who has what you consider to be ideal mechanics? I’d love to hear this too, especially guys who throw hard. All the safe-looking motions that come to my mind are soft-tossers like Buehrle or retired guys like Rivera. In all seriousness, my vote goes to RA Dickey. He is throwing an 80 mph knuckleball and has no ulnar ligament. How is he doing that? I think I’ve mentioned Dickey before as having pretty clean mechanics. I don’t know if they’re “ideal” but they seem pretty efficient from what I remember. It’s hard to say someone has “ideal mechanics” for several reasons. First, every person’s body is different, so mechanics are going to look different from person to person. Second, I’m not even sure what “ideal mechanics” means — it can mean different things to different people. Scientifically, there are ideals that a pitcher can strive for, but I don’t know if it’s possible for one person to set as a model for everyone else. Third, it’s nearly impossible to really know whether someone has achieved all the “ideals” in a pitching motion without viewing the pitcher from several angles on high-speed cam. Does this mean that the holy grail of “ideal mechanics” is an exercise in futility? Heck no — trying to imitate someone else is not the only method of perfection. Efficient and safe pitching mechanics are not unlike hitting mechanics — there are specific points in the action where the body needs to be in a certain position. Foot strike might be the most important in terms of efficiency and performance. Release point is also important. Post-release — what the arm does and what the body does during deceleration — is incredibly important toward arm health. If a pitcher can move his body well at those three checkpoints, he’ll probably keep his arm safe and will have a good foundation toward optimum performance. If something is incorrect at one of those spots, there’s a good chance he’s putting his arm in danger, even if he’s able to perform in spite of the inefficiency. Thanks for the foot strike advice. I recently spoke to a MLB pitcher about the best way to teach kids to pitch. His main point was teaching them to keep their shoulder closed. On a separate note but along the same lines, I am concerned about Vic Black and his shoulder. Rotator cuff sounds like could be a serious issue. On the bright side, this rash of injuries means some top prospects may get a look in earler than expected. Who do you think is in line? Unfortunately most current and former MLB pitchers don’t know much about pitching mechanics, because their knowledge is usually limited to whatever another former pitcher taught them (i.e., few pitchers get advice from experts in body movement / kinesiology). At what point in the motion is this MLB pitcher saying the front shoulder needs to be closed? And what does “closed” mean? Interpretation is important. He’s probably trying to explain “separation.” A better description of what has to happen is “stay sidewise to the plate at foot strike.” Kids may try to turn their front shoulder too far in, too early in the motion. I know Zack Wheeler was doing this prior to his MLB callup, and because he didn’t understand what he needed to do, he was actually robbing himself of velocity. Vic Black’s issue is greatly concerning. Beyond the injury is the fact he is yet another Mets pitcher who pitched through 2014 in pain. It’s not “normal” to pitch in pain, and every pitcher who says it is, is speaking from ignorance. It’s not their fault, because, again, they’re listening to what other pitchers say instead of experts in anatomy and body movement. Who’s next in line? I suppose whomever doesn’t hit the DL next. Montero, Goeddel, and Mazzoni seem to be next on the depth chart. Sad to say, but from following this site the Wheeler injury is no surprise to me either. My question to you is regarding deGrom, who already has had a TJ and was converted to pitching in college. What do you think of his mechanics and the likelihood of a TJ recurrence? Something caused the first UCL tear, but I don’t know what it was and I bet no one bothered to figure it out. 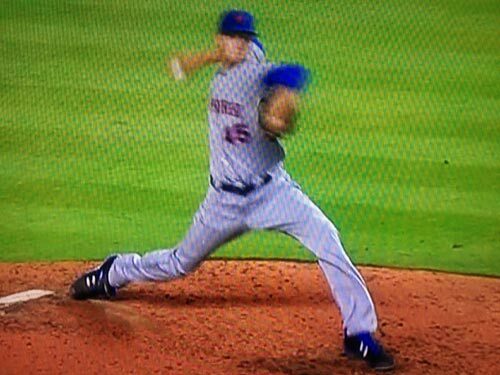 From what I’ve seen of deGrom thus far, two things that jump out at me are that his arm is often behind where it needs to be at foot strike and he doesn’t always properly release his elbow after release.Both issues can put strain specifically on the elbow. Does that mean he’ll tear his UCL again? Maybe. Are these flaws correctable? Absolutely. Will they affect his performance? If anything, they’ll probably improve performance. What compounds the mechanical flaws are long tossing (I don’t know if deGrom long-tosses) and doing a bullpen two days after a start (I’d bet the house he does that). If pitchers didn’t long toss and would adhere to the recovery guidelines, their mechanical flaws might not be as damaging — at least, not as quickly. Vic Black might have a rotator cuff injury. In the 90’s, I remember it was rotator cuff injuries that seem to effect pitchers more so then elbow problems. Am I remembering correctly? Is it possible that pitching coaches tweeked deliveries to take stress off the shoulder and inadvertently added stress to the elbow? Hard to guess whether pitching coaches made more mechanical tweaks in the past; regardless, they probably were as ignorant back then as coaches are now. What HAS changed, though, is the proliferation of pitching coaches teaching youths over the past 20 years, as well as a more aggressive and universal chase for velocity. Between 99% and 100% of those pitching coaches do not have an advanced background in kinesiology nor biomechanics, and therefore could very well be teaching dangerous mechanics. Add in the ridiculous amount of long-tossing, weighted ball regimens, and other gimmicks to chase velocity but put tremendous stress on the elbow, and it’s not surprising that there are so many UCL tears. I’m not sure if shoulder injuries have decreased. I also remember the careers ending due to rotator cuff injuries, but today we’re seeing plenty of shoulder injuries that are being treated. Additionally, every pitcher knows they need to do “Jobes exercises” for their shoulder. Eventually every pitcher will realize they also need to do exercises for the elbow as well, and it baffles me that there are so many current and former MLBers who insist the elbow “can’t be strengthened.” Of course it can! It’s a HUGE part of TJ surgery rehab, for goodness sakes! I’m new to this blog and just wanted to say I find this discussion riveting. Really interesting stuff. It’s so ironic to me that an industry with seemingly unlimited resources can, in so many ways, still be so rooted in arbitrary, antiquated metrics and ‘traditional’ knowledge. I hope things change soon for the sake of these young pitchers! Thanks for the analysis, Joe.